Ask fellow campers about "Oregon Inlet" and nearby attractions. Question: Is there an access to drive on the beach since the walk to the beach is far? Answer: The walk to the beach from the camp-sites would not be too far for most people, but you do have to climb up and down some sand dunes. I don't recall a road to the beach from within the camp ground, but there were at least two roads thru the sand to the beach nearby. You do need a permit to drive on the beach, and the office issuing those is just north of the camp ground and on the east side of the highway. I did not drive on the beach so I don't know if there is a charge for permits. A nice place - they are bringing electricity (20-30-50 amp) & water to the sites. We had one of them & it was nice to run the AC. A bit of a walk to the ocean but not too bad. It was a nice beach! The showers were acceptable but no heating past solar. Back in site. We fit with a big overhang in the back. With our dolly pushed up under the front of the 30' Class C we had room to park the Toyota Camry in front. There were no fires allowed. We'd stay there again. We camped at Oregon Inlet in a Motorhome. We toured the Outer Banks including a stop where the Wright brothers flew their first aircraft. Narrow roads, could be tight when the campground is full. Only a handful of campers when we were here, since we're early in the season. Great location for exploring north to Corolla and Carova Beach, and south to catch the ferry to Ocracoke. No trees, just sand dunes and sea grass! We didn't hear road noise but we had 25-35 mph winds that drowned out everything else. We camped at Oregon Inlet in a Motorhome. This is CG is part of the National Park system in Cape Hatteras National Seashore. The roads and sites are asphalt. The sites pavement is just wide enough for the RV and some sites will probably fit a 45' MH but you'll have to make other accommodations for your towed vehicle. We stayed here in late November and just parked in an empty site across from our site. The showers are built more with the beach goer in mind with no real convenient place to hang your cloths without getting them wet from the shower. I was expecting cold water but it was comfortably warm with so so pressure. Our site was a short walk over and through some dunes to the beach. If you come here during the summer it is recommended you bring a shade/bug shelter and be prepared for hot sticky weather. There is no shade at all and there's a reason why the Wright Brothers choose this area for flight testing, the wind. It will blow pretty much every day and if you are gong to stake something down make sure you have long stakes 12" or longer would be great. Besides the beach there's several lighthouses in the area and a few miles away is the site of the "Lost Colony" and a nice N.P. museum there. Verizion phone and Mifi worked reasonably well. We'd stay here again if we're in the area. We camped at Oregon Inlet in a Motorhome. Most National Park campgrounds have potable water fills and dump stations at their entrance, or inside the campground. The three Cape Hatteras campgrounds we visited decided to break with this pattern and place theirs at undisclosed locations, and not necessarily near the campgrounds. (Potable water is available from spigots throughout each campground, but I have been told those are not to be used for filling fresh water tanks.) Oregon Inlet was less than 1/3 full when we visited in early May. We chose the largest site available, it was almost long enough to accommodate our 35 ft. 5th wheel and 23 ft. tow vehicle. To fill our tank, we had to go south of the campground to a marina on the opposite side of the highway where there was a potable water spigot and dump station. While the station's features were labelled, there were no directional signs to guide you to it, nor was it noted on the literature provided upon check-in. The Ranger (maybe he was a volunteer) who checked us in provided very vague instructions for finding it. We camped at Oregon Inlet in a Fifth Wheel. Be sure to get water and empty your holding tanks before entering the campground. Loved this campground as a place to visit the outer banks. It is dry camping, so come prepared. Sand spurs are everywhere...BUT...it is steps from the wild Atlantic and convenient to historical sites both north and south. Pick your site carefully if you have a large unit. Our 33' and jeep just barely fit. We camped at Oregon Inlet in a Motorhome. Lots of historical sites nearby: Kitty Hawk and Kill Devil Hills (take the ranger tour! ), light houses and other historical sites as you go south. Shopping reasonably close. Plenty to do! Rangers are friendly. No hookups, bring drinking water, and only cold showers. The price is cheap compared to the RV parks. We camped at Oregon Inlet in a Travel Trailer. This is one of four NP campgrounds on the outer banks of NC. This is my least favorite of the outer banks campgrounds yet the bathroom was clean and the rangers very nice and informative like the other NPS campgrounds. It needs upgrading and they are working on the restrooms in some of the loops hopefully in operation by Memorial Day. 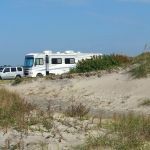 There is no privacy between sites but this campground is near a lighthouse, marina, fishing pier and a few dunes away from the ocean. The beach is not as nice as Ocracoke or the Frisco campground beaches. All sites do have a picnic table and grills but no hookups. No fires are allowed except on the beach and no reservations. We camped at Oregon Inlet in a Motorhome. This campground is nice enough for a short stay on the OBX. It's dry camping with no amenities. There is a bathhouse with cold showers. There is no shade anywhere in the campground. The roads are paved and the sites are paved and level. The sites are long enough to park a 40ft motorhome but very few are long enough to park a 40ft motorhome and your car. We had a lot of rain during our stay but the campground drained fairly well. There were lots of mosquitoes. The campground staff were friendly and helpful. We would definitely stay here again. We camped at Oregon Inlet in a Motorhome. Golden Age Pass $10. This campground has three loops. One is for tents and the other two for anyone including some big RV’s. There are no hookups and the site is paved a little but the rest grass. Sand dunes are all around this campground and one must hike over the dune to reach the beach but it is not far or you can drive your four wheel drive vehicle out using the park road. The bathrooms are clean and presentable. No hot showers just cold showers in a little building to get the salt and sand off you. The rangers are very nice and the campground fills up on most weekends in the summer but not during the week. The sites are not reserve able! Nice stay and we would come back. Bring water though because I don’t know if you would want to drink it unless you boiled it but that was just one persons opinion! We camped at Oregon Inlet in a Motorhome. This is an awful campground. No Utilities, cold water showers, located right on the road, the beach is a long walk away, and it is not even a good beach. The only reason I stayed there was it is the closest campground to Nags Head and Manteo. The worst part was the lack of security. When the ranger on duty leaves, there is absolutely no one in control. No gate, only sporadic patrol, no campground host. Quiet hours are supposed to start at 10 p.m. but there is no enforcement of the rules. People ride through making noise all night and groups have loud parties. A whole group of campers complained to the ranger about a loud drunken party the night before (with air horns and car horns blowing until 3 a.m.) but the offenders were only given a warning and were not even asked to leave. I left earlier than I had intended because I did not feel safe. I plan to complain to the National Parks Service. I will never stay there again. We camped at Oregon Inlet in a Motorhome. This is no place for older folks in a motorhome unless you enjoy dry camping. Motorhomes can only use the "C" loop. Generators cannot be used at night. While we were there, the toilets for that loop were under repair. If you are looking for a beach location, this is "not" it. It's a good 800 yards to the beach up and down dunes. It was so hot while we were there, we gave up 4 prepaid nights and where able to find another campground with electric. We camped at Oregon Inlet in a Motorhome. Are you affiliated with Oregon Inlet ?